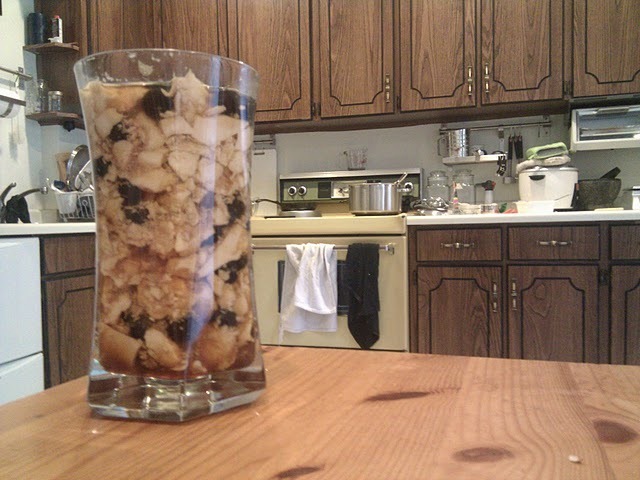 When I was growing up, we often had taho for breakfast. Manila had many magtataho who roamed the streets each morning, with two aluminum buckets hanging in balance from a pole. One bucket had tofu, and the other had compartments for tapioca pearls and sugar syrup. Yaya would have glasses filled and brought upstairs, where they would wait under crocheted glass-covers for us. Sometimes I lucked out and had two glasses of taho, like when I knew other people had finished breakfast already. Sometimes we had taho for afternoon snacks, too. It was fun watching the vendors work: swiftly scooping the tofu into a glass, spooning tapioca pearls in, swirling the syrup and mixing everything together. There are no taho vendors in this part of Toronto – or perhaps anywhere in Canada. But we can get silken tofu and tapioca pearls at the Lawrence Supermarket on Black Creek Drive. After five years of only having taho on my trips home, I found a recipe on the Internet and made taho for the first time. It’s simple: a syrup of brown sugar and water, tapioca pearls, and warm silken tofu. It tasted like the quiet mornings of childhood. should check it out during the holiday break. Random Emacs symbol: cons-cells-consed – Variable: Number of cons cells that have been consed so far. Strangers Meet” – it’s available at the Canadian Film Board.